THE HAUNTED Launch Second Video/Single, "Spark"
Swedish thrash metallers THE HAUNTED will soon unleash their upcoming ninth studio album entitled, Strength In Numbers, on August 25, 2017 worldwide via CENTURY MEDIA RECORDS. In celebration, the band is excited to reveal the music video for the second single, "Spark". Watch the blazing video, produced by Oscar Dziedzela (OD Visual), now on KNAC.COM HERE. THE HAUNTED previously unveiled the single “Brute Force”, which you can watch here: https://youtu.be/SQye-TXtw2w or stream via Spotify http://bit.ly/BRUTEFORCE. In addition, a playthrough video featuring guitarist Ola Englund can be see here: https://youtu.be/Lh9KIkOv4LE. Recorded at Parlour Studios in the UK with producer Russ Russell (NAPALM DEATH, DIMMU BORGIR, THE EXPLOITED), Strength In Numbers comes with artwork by THE HAUNTED’s longtime designer Andreas Pettersson. The album’s limited edition Mediabook CD version will additionally include the bonus tracks “Illusions” and “Sinister”, expanded layouts and 3 stickers. Strength In Numbers will also be available on 180 gram vinyl in various editions: Black LP (Unlimited), Silver LP (200 copies / Sweden) and Clear LP (300 Copies / USA). 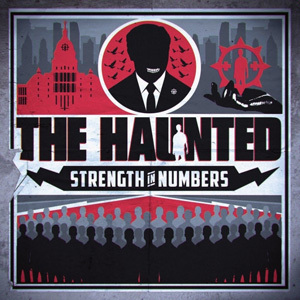 And last but not least, a strictly limited “Guitarist Edition” Deluxe LP package of THE HAUNTED’s Strength In Numbers release will be available from CM Distro / CM Webshop in Europe. This very special edition of the new album is limited to 500 copies on exclusive transparent red 180 gram vinyl and comes with a printed guitar tablature book of 28 pages in LP booklet format, a poster, a set of 3x THE HAUNTED guitar-picks and the entire album on CD as bonus.